The Official Bicentennial History of the United States Marines Corps Commemorative Medals Set (Franklin Mint, 1974) Current Market Value. This collection was issued by The Franklin Mint to honor the 200th Anniversary of the U. S. Marine Corps. This was the first medallic series covering the entire 200 year history of the U. S. Marine Corps ever minted. 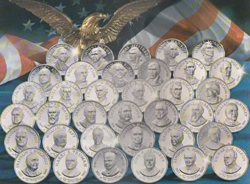 The collection consists of 24 sterling silver proof medals. Bicentennial Histories of the U. S. Navy and the U. S. Army were minted and issued simultaneously with this series. The edition was minted in sterling silver and was issued in 1974-1975. Each medal is 39 millimeters in diameter.